Nikon D7100 camera at the base of the “Christmas Tree” Starting Line Lights. are receiver/transceiver units which can remotely trigger a camera’s shutter from a distance. This allows me to put a camera in places which are not safe to photograph from. At ESTA, I put a Nikon D7100 camera with a Tokina 11-16mm f/2.8 Ulta-Wide Angle (UWA) Lens at the base of the “Christmas Tree” Starting Line Lights. As you can see, it would not be very safe for anyone to sit in front of drag racers taking off within a few feet. I photographed during the morning time trials as each pair of competitors start at the same time. The object is to get the best time down the quarter mile track. 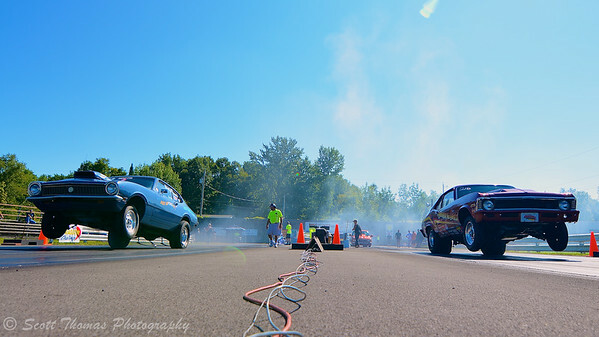 Ford Maverick (left) and Chevy Nova (right) pull wheelies as they leave the Starting Line at ESTA Safety Park Dragstrip near Cicero, New York. Nikon D7100/Tokina 11-16mm, 1/1000s, f/3.5, ISO 100, EV 0, 12mm focal length, PocketWizard. As you can see, in the morning, the camera faces into the Sun causing a little lens glare. Next time, I plan on shooting in the afternoon when the Sun is more behind the camera’s location. Dodge Challenger (left) and Ford Mustang (right) hook up as they make their run down the track at ESTA Safety Park Dragstrip near Cicero, New York. Some of the racers really like to put on a show with wheelies. 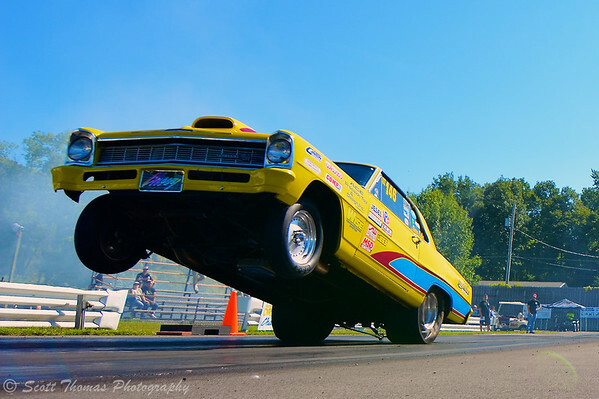 Click here for more racing action from ESTA Safety Park Dragstrip in 2014. 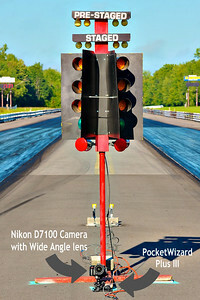 Putting the show on the Starting Line at the ESTA Safety Park Dragstrip near Cicero, New York. Nikon D7100/Tokina 11-16mm, 1/1000s, f/3.2, ISO 100, EV 0, 12mm focal length, PocketWizard. It is going to be a lot of fun trying out different locations for my cameras using the PocketWizards. 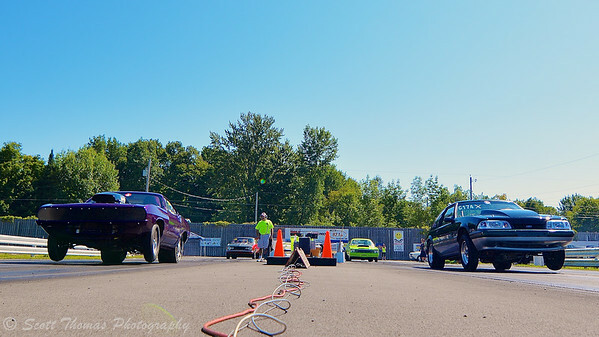 This entry was posted in Sports, Weekly View and tagged automobiles, cars, cicero, dragstrip, drivers, esta safety park, new york, nikon D7100, pocketwizard, racers, racing, tokina 11-16mm, uwa, wheelies. Bookmark the permalink.